Sir - as I told you on the telephone, I was driving north on I-55 about a 1/2 mile south of the Rt 10 overpass. This occurred last Wednesday (August 10th) around 11:15 PM. 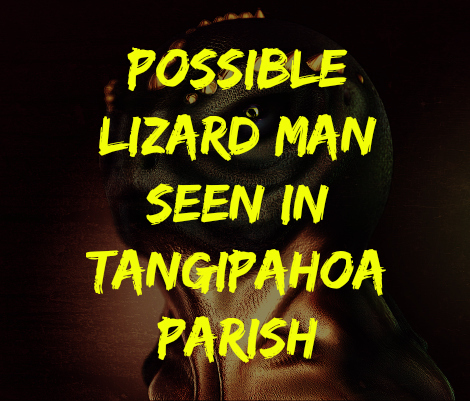 This was is in upper Tangipahoa Parish. I was on my way home in Jackson, MS.
About 100 yards ahead, I saw something crossing the highway from my left to right. When my headlights lightened it up, I swear I saw a walking lizard man. It walked like a human on its feet and was greenish-brown shiny skin. The huge thick tail was prominent and reached the roadway. The body was that of a man - same arms, legs and head - maybe 6 ft tall. It swiftly crossed the highway. I lost track of it when I passed by. I still can't believe what I saw. I saw some stories you had on someone's website and found your telephone number. I haven't told a soul about this. The witness had told me that his uncle had an encounter with an unknown aquatic humanoid while fishing in a bayou in southwest Mississippi in 1997. He had described it as dark in color with human-like features, but the skin was 'slimey' looking. He observed it at a distance of about 200 ft. when it left the water and walked away. The witness said that his uncle was never the same after that sighting and that he committed suicide in 2006.